The Missouri Articles of Incorporation of a Nonprofit Corporation | Form Corp 52 will report required information to the Missouri Secretary of State concerning the formation of all nonprofit corporations. Here, you must make sure you are aware of the requirements for the type of nonprofit being formed. All nonprofits (unless otherwise indicated by statute) will be considered either a public or mutual benefit corporation that are either Tax-Exempt or not Tax-Exempt. Bear in mind, if the entity will apply for Tax-Exempt Status, these articles will need to be filled out precisely to the 501(c)(3) requirements placed by the I.R.S. as only the I.R.S. may grants such status. It is highly recommended to contact this entity before filing these articles should Tax-Exempt Status be sought. The Missouri Articles of Incorporation of a Nonprofit Corporation may be filed by mail or online. If filing by mail, make sure to include all required documentation and submit with a check for $25.00 (payable to Director of Revenue) to Secretary of State, Corporations Division, P.O. Box 778/600 W. Main Street, Rm 322, Jefferson City, MO 65102. If filing by mail go to https://bsd.sos.mo.gov/LoginWelcome.aspx?lobID=1&ReturnURL=~/BusinessEntity/NewBEFiling.aspx?beID=3175573%26FilingTypeID%3d1844 so you may set up a login or sign into your account. All online Filing Fee payments will also be required with the Articles in the form of a Credit Card. 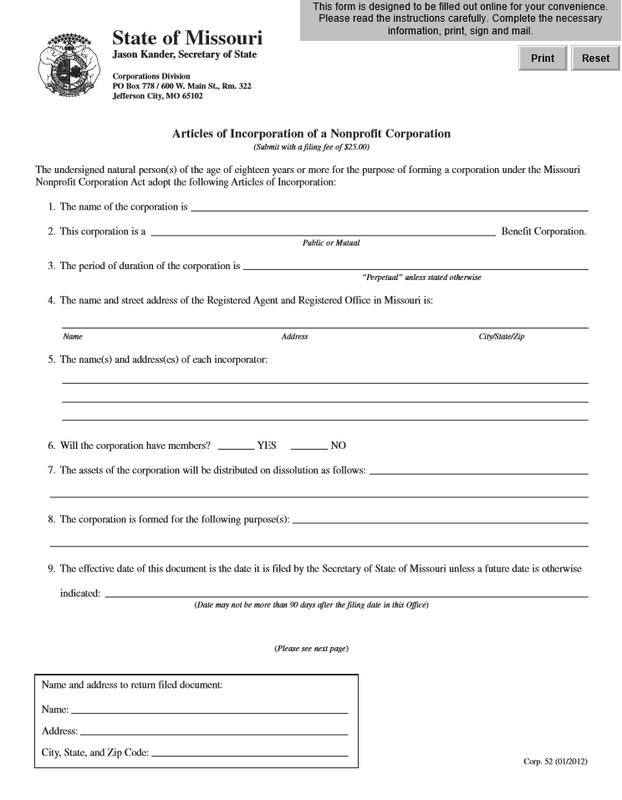 Step 1 - Download the Missouri Articles of Incorporation of a Nonprofit Corporation by clicking here: Form Corp 52 or by selecting the “Download Form” link above. You may print this form out or fill it out on screen with a valid PDF editing program. Note: All articles must be filled out, if you run out of room continue reporting the information on a separate sheet of paper that is clearly and accurately labeled. 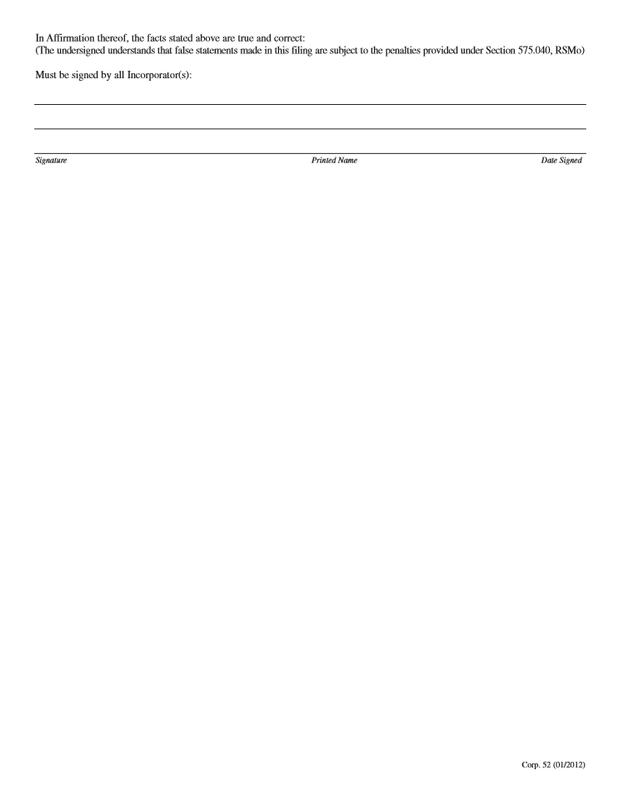 Step 2 - In the First Article, report the Full Name of the nonprofit corporation. Step 3 - In the Second Article, report whether this is a Public or Mutual Benefit Corporation. Step 4 - In the Third Article, enter number of years this corporation shall be active or enter the word “Perpetual” if it intends to operate indefinitely. Step 5 - Report the Full Name and Full Street Address of the Registered Agent that shall receive service of process on behalf of this corporation should it be sued in the Fourth Article. This must be a physical address in the State of Missouri (do not use a P.O. Box or something similar). Step 6 - In the Fifth Article, provide a list or roster of each Incorporator. This should consist of the Full Name and Address of each one. Step 8 - In the Seventh Article, define how the assets/properties of the nonprofit corporation will be distributed should it dissolve. Be very specific. Step 9 - In the Eighth Article report the Purpose of the corporation on the blank lines provided. Step 10 - The Ninth Article is optional. Should you desire the Effective Date of these articles to be after the Filing Date, report this Date on the line provided (must be within 90 days). If not, then you may leave this section blank. Step 11 - The last section of this page is a box where you must report the Recipient Name and Address for the return of these articles for corrections or where the Certificate of Incorporation may be mailed by the Missouri Secretary of State. Step 12 - The next page will be the Signature Line. Each Incorporator previously listed must provide a Signature, Printed Name, and Date of Signature.